American Elf Book 3 cover image is courtesty of barnesandnoble.com. Cartoonist James Kochalka began converting his life into art back in 1998 in the form of a daily diary drawn as a cartoon strip. This daily diary moved online in 2002, and a complete archive of these cartoons can be seen at americanelf.com. 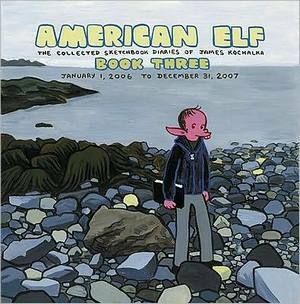 American Elf (Book 3): The Collected Sketchbook Diaries of James Kochalka collects the diary strips from the years 2006-2007 in full color. Each diary entry or episode usually depicts one event or theme in Kochalka’s life that day; sometimes a cartoon portrays two events. American Elf is set in Burlington, Vermont, which is where Kochalka lives. He portrays himself and his wife as elves, but draws their son, Eli, as a human child. Kochalka draws some of his friends and associates as humans, while drawing others as fanciful monsters and creatures; his brother and father have also appeared in particular strips as elves. American Elf (Book 3) presents the events both momentous (such as the birth of Kochalka’s second child, a son named Oliver) and trivial (the author putting a political sticker on his cat’s forehead), but it’s all magical. Individually, many of the strips don’t resonate, but taken as a whole, that which seems quirky and too silly or sad and overly poignant is quite enjoyable. It’s hard to stop reading and put this book away somewhere out of sight. The American Elf collections are likely the best way to read Kochalka’s daily dairy webcomic strip. Why? American Elf reminds us – because we often need it – that life: the grand, the horrible, and the ho-hum, is beautiful. Sometimes, that makes sense if we can look back on a chunk of time rather than on one very good or very bad day. That’s Kochalka’s way of telling us that it’s good to be alive.